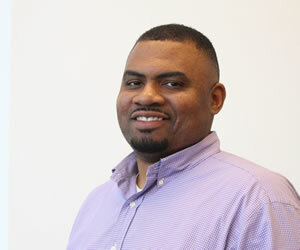 Darian Williams, MBA, is an accountant at Grady College. You can walk by and see this friendly face in the Business Office in room 209 on the main floor of the Journalism building. Darian received his Bachelor of Business Administration with a specialty in accounting from the University of West Georgia in 2004 and later received his Master of Business Administration from the American Intercontinental University in 2013. In this spare time, he likes to read, record music and write. He self-published his first book in 2014 on Christian-centered relationships. He prides himself on being a man of faith and being a listening ear for counsel and offering instruction. Darian has been married to Dr. Brittany Williams for seven years and has one adorable daughter by the name of Merritt.